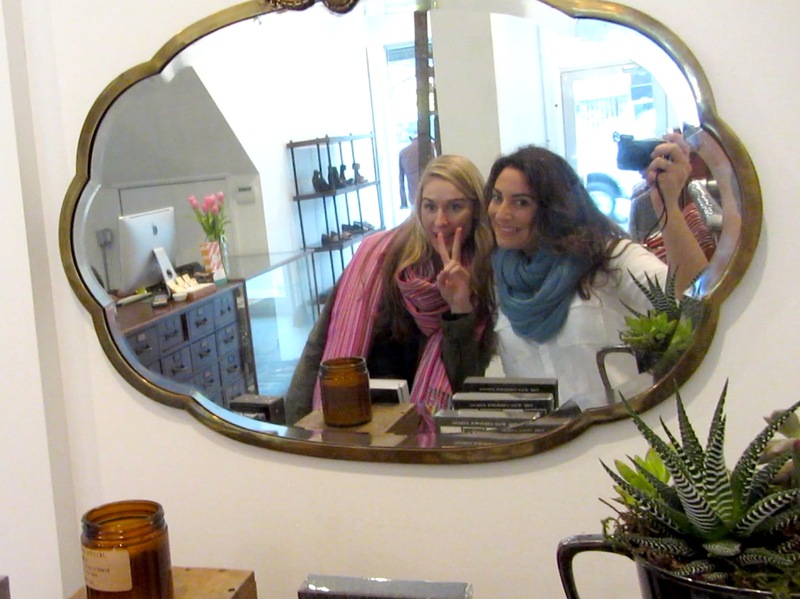 go site Here are my top ten gifts for travelers this holiday season. This list is for men and women who are both leisure travelers and business travelers. These are products and services that I personally enjoy as a frequent traveler or that I really want myself! http://femininemoneymagic.com/?x=other-drug-like-viagra You won’t find any globe lamps or necklaces shaped like the continents. 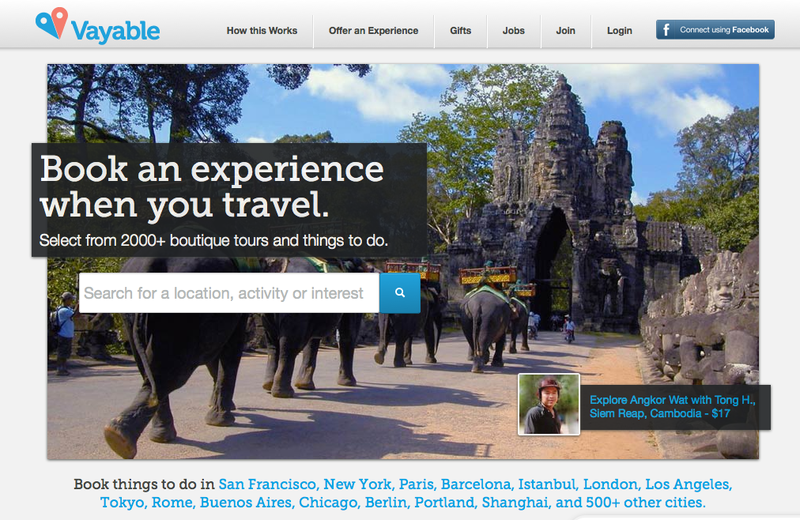 These ideas are specifically to address real needs and wants of travelers. 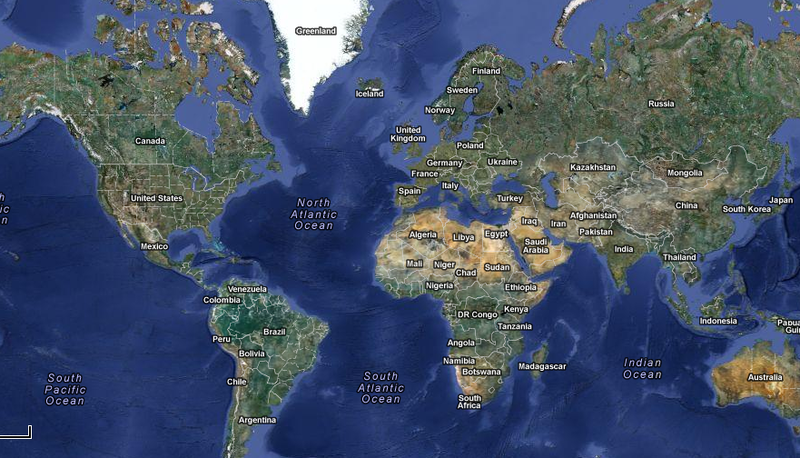 I know, it’s not the sexiest part about travel but it’s a real consideration. Since my early twenties, I have had a problem with swelling in my legs when I fly on long-haul flights. This is common for many people of all ages on flights as well as simply when sitting in our chairs all day at work. Years ago, I realized just how serious swelling can be when I was flying from Athens to Los Angeles on an EARLY morning flight. Being spry and in my early 20’s, I decided to stay awake until I had to leave for the airport at 4am. I had been out with friends, drinking and eating salty foods like feta and olives. By the time I got to my seat on the plane, I was ready to sleep. When I woke up hours later, my legs were really swollen. It was so bad, I had to go to the emergency room after I landed. Luckily, it turned out I didn’t have a blood clot. But ever since then I’ve been very mindful of the dangers of swelling on long-haul flights. And that’s why I like this company. They make compression legwear that is fashionable for men and women. That means, no ugly or sporty socks or legging. 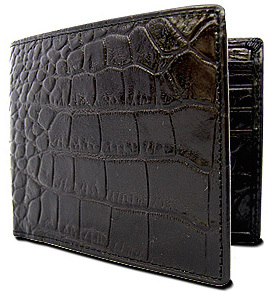 I think this makes a great utilitarian and fashionable gift for any traveler. And if you can’t decide what to buy, the company offers gift cards. Check them out here. A couple years ago my mom bought me a Lay-N-Go for Christmas. She was raving about how cool she thought it was despite having never had one of her own. 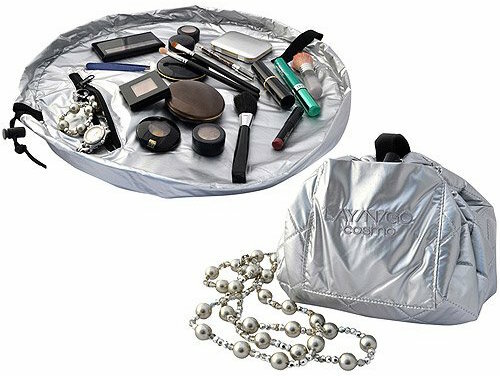 It is a bag for cosmetics or any kind of toiletries, products, cords, or loose small objects you may need to tote around. The bag fastens with a drawstring. And the real unique part is that when you open it, it transforms completely into a flat piece of material. This helps to reveal every thing in the bag for quick and easy access. Then once you are done, it takes literally one second to convert it back into a fastened bag. I decided to give the bag a go and have been using the same small, silver Lay-N-Go for the past two years for all my travels. Actually, I even use it at home. I like how it is easy to clean too. If make-up or products ever spill you just wipe it down with soap and water and let dry. You can buy the Lay-N-Go here. All the hype about people being able to steal your credit card info with a simple scanning device is a real concern. On a recent trip in Europe, I seem to have fallen victim to a credit card RFID scan scam. More than one of my cards turned up having fraud alerts on charges in Europe after my trip. And this happened even on cards I didn’t use while abroad. So now, as a traveler, I’m in the market for an RFID-blocking wallet and passport case to protect my credit cards and identity. Better safe than sorry. Here are ones that looked good to me. The Kenakai wallet pictured above on the left and the RFID Blocking Sleeves on the right. 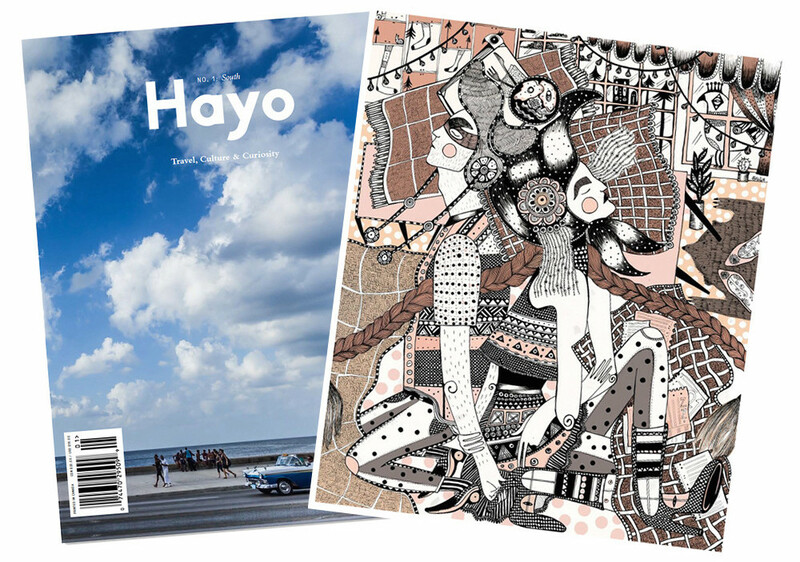 Hayo is both an online journal and print travel magazine. The first paper edition was released earlier this year. I’m unaware of another travel magazine out there that maintains an equal level of integrity and authenticity. Not a booklet of glossy pages cluttered with advertisements – Hayo quenches a yearning that travelers hold to connect with the soul of destinations even from the comfort of home. The pages are full of thoughtful travelogues, features on local artists, tips on what to do and where to go, as well as inspiring poetry. Hayo is running a holiday gift special for $40 that includes an annual subscription to the mag (that currently publishes twice a year) and a print by the very talented artist, Ola Volo. Get it here. I like taking quality photography while traveling. But even as smart phone cameras are getting better they are not as versatile as a high-end camera. 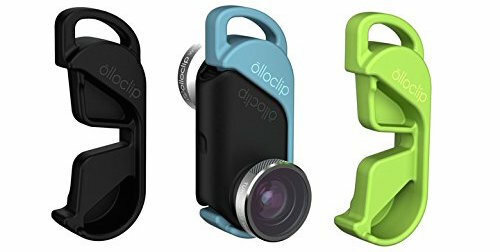 Short of buying and/or bringing along a separate camera, there are quite a few lenses out there you can buy that clip onto your phone transforming it into nearly pro-level, photography equipment. One I like is the Olloclip. It comes with multiple lenses from wide to fisheye to get a variety of looks. Here’s a link for the iPhone 6. You will find that there are many options out there. As a frequent traveler for business and leisure travel, I have struggled with maintaining my routines. Everything from keeping my diet in check, to regularly working out, and to staying committed to my meditation practice is harder with frequent travel. And I have found that the 5-Minute Journal is a great tool to help keep accountable to all routines. 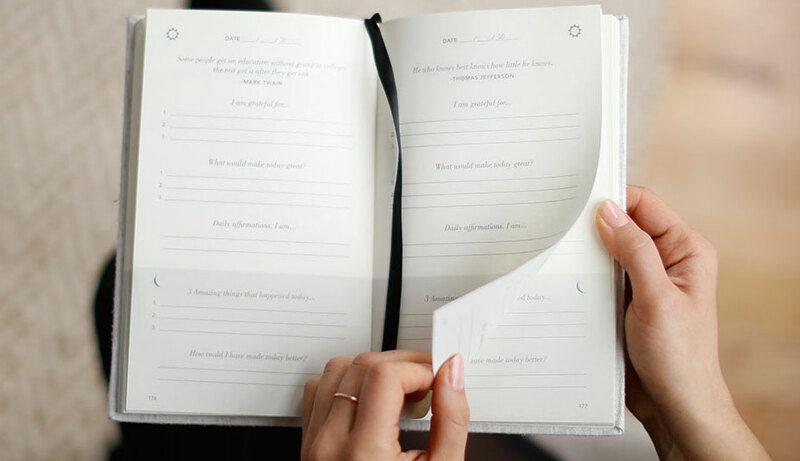 The sleek little book requires you to take a couple minutes every morning when you wake up and when you go to sleep to answer a few questions. In the mornings, you read an inspirational quote for the day and answer the questions about what you are grateful for and ways for making the day a success. And in the evening, you fill in what made the day great. You also write how you can make tomorrow better. The ritual of the 5-minute Journal has this rather reliable way of keeping you accountable to your goals and commitments. It also helps you to focus on the positives in your life, lifting your mood day after day. The key is that you keep up with the journal at home and on the road. Get the 5-Minute Journal here. There is nothing better than being able to get some sleep on a plane. But unless you are in business class, sleep sure can be elusive. For me, the combo of ear plugs, eye mask, and pillow (or rolled up puffer jacket) can work. 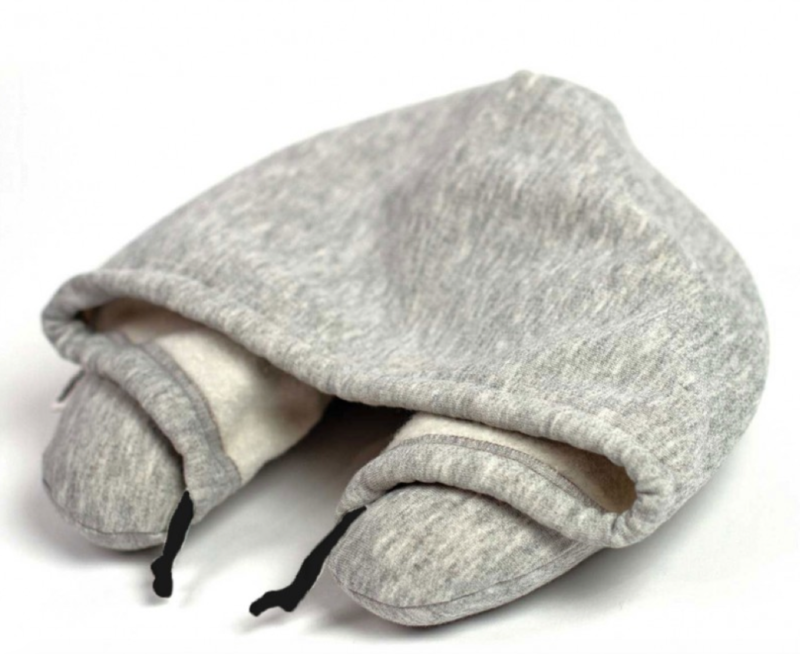 But I’m digging this – the Travel Hoodie Pillow. It seems like it would add another desirable dimension to a sleep system. I think the grey one looks the best, and it’s totally unisex! Get it here. Perfume and cologne wearers don’t want to go without their signature scent while traveling but we often do because our fragrance bottles are just too big, fragile, and leak-prone to pack with us. After searching online, I liked these atomizers. I’m on the market for a new one myself and I liked this option: The Sen7 Fragrance Atomizer. Ok, this may be more for the ladies. But as a female traveler, I know how hard safely transporting my necklaces and other jewelry can be. Even felt jewelry pouches can leave your necklaces tangled as they jostle around during travel. 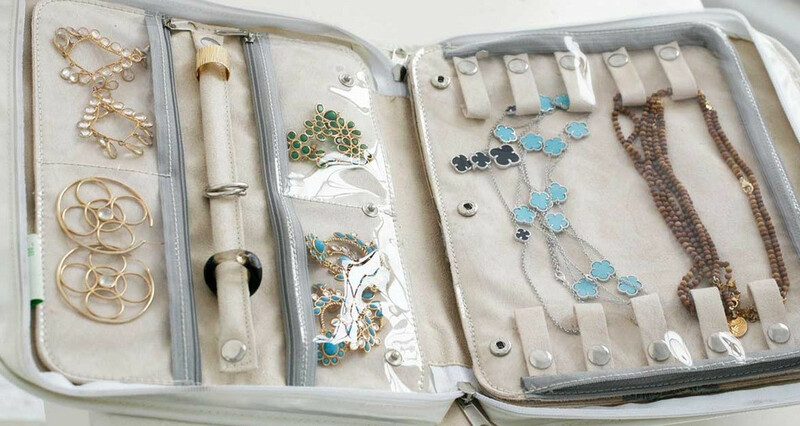 The solution is a jewelry case that makes special accommodations for necklaces as well as other less-tangle-ables. On my shopping list is the Clos-ette Travel Jewelry Case. It comes with many different inserts that you can use to customize the case for your needs. But the feature that sets this case apart from others is the necklace storage solution it offers. Little clips allow you to suspend multiple necklaces so they can’t tangle. The case holds a remarkable amount of jewelry in one small pouch. So I’m smitten. Here it is. If the person you want to get a gift for really wants to travel, but at this point may not have all the funds necessary to book, you can help them along. Sure, you could give them cash or an American Express gift card they can use anywhere. But you could also buy them a gift card for an airline. Many airlines offer this option. 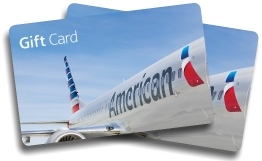 Here are links to United and American Airlines. And that’s it for this list! I hope these suggests helped to make your gift giving a little easier.